During Judas Priest's extended hiatus during the 90's while they looked for a replacement for Rob Halford, guitarist Glenn Tipton put together some ideas for his first solo album. He recruited legendary Who bassist John Entwistle and legendary drummer Cozy Powell who besides getting his start with the Jeff Beck Group in 1971, did stints in MSG, Black Sabbath, Whitesnake and ELP as well as being part of the legendary Dio-era Rainbow line-up that that recorded such classics as Rainbow Rising and Long Live Rock and Roll. After approaching Atlantic Records with the finished product, they suggested to Glenn that he work with younger musicians to give his music a more "modern" sound. These particular recordings were shelved and he started over eventually releasing Baptizm Of Fire in 1997. That CD only featured a couple of tracks from the sessions with John Entwistle and Cozy Powell. Recently, Glenn finally got Rhino Records to agree to release these initial sessions for the very first time. The plan at the time of these recordings was to eventually do a tour as a three piece seeing that Priest was on hiatus at the time. As fate would have it, that time never came with Glenn getting back to Priest full time in 1998 coupled with the untimely death of Cozy Powell in 1998 as a result of a car accident and John Entwistle's death in 2002. I wasn't even aware of these recordings until just recently and the prospects of Glenn Tipton, John Entwistle and Cozy Powell all together for an entire album sure set the stage for something that if nothing else, gives both John and Cozy the chance to again thrill us with their talents and abilities one last time. 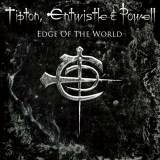 Edge Of The World offers a wide mix of material with the melodic heavy metal/ hard rock of Friendly Fire and the Bob Catley like melodic catchiness of Never Say Die to the more laid back and acoustic flavored Searching and Crime Of Passion. Whitesnake and Bad Company come to mind with the mix of soulful acoustic and heavier sections for the track Holy Man. Complete with spirited handclaps, the catchy and cool track Give Blood throws a passing nod the 80's hair metal days. The heavier Judas Priest influence appears with some subtlety for the darker and more atmospheric Resolution with its great heavy romping groove. Those chomping at the bit for more of the Priest sound finally get their wish by the 9th and 10th tracks on the album. Walls Cave In is a solid riff driven track that has all the thundering heaviness and gang style choruses that make many a Judas Priest track and the title track Edge Of The World features the more slower and plodding Judas Priest style. This one's easily the best track on the album. The final track Stronger Than The Drug features Neil Murray (Whitesnake, Gary Moore) on bass and comes off as slightly more catchy and commercial version of the Turbo era of Priest. Glenn Tipton's voice sounds a little better on the Baptizm Of Fire album and even though he makes a very valiant attempt at doing the lead vocals, his suprisingly high pitched voice often strains and is off key. The music is solid as are the song arrangements but unfortunately, it's his vocal style that plagues quite a few tracks on this album. There's a small handful of very good, if not excellent tracks although I was hoping for a little more adventurous bass lines from John Entwistle. He keeps it very simple yet very, very solid. His booming bass lines during the more Priest like tracks are more along the lines of Ian Hill's playing. Cozy Powell's drumming is as solid as ever and the production is very clear and precise. Glenn Tipton was certainly bearing his soul for this album and it is also a very personal one at that. His lead guitar playing is excellent with several tracks having his trademark Judas Priest style ripping lead guitar. There's so much potential with many of these tracks if only Glenn had recruited someone else to do the vocals. However, that was not his choice as he wanted to do it all himself for his very first solo effort. What we are left with here is an album that features Glenn Tipton playing with two legendary musicians in John Entwistle and Cozy Powell, both of whom are no longer with us. It was an interesting union that produced some flashes of brilliance yet still contains some very lack lustre and very average melodic hard rock. This album's worth picking up just for the sheer curiosity of what these three guys sounded like together and just for having a piece of musical history that many of us never knew even existed.